Jean René Constant Quoy and Joseph Paul Gaimard cruised the world in their corvettes, the Uranie and the Physicienne, naming species as they went. If “Quoy & Gaimard (1824)” looks familiar, it’s because these gentlemen described the Galápagos Tortoise (well, one of them), the Cookiecutter Shark and many other species. Quoy & Gaimard also observed some of the poorly-known (then and now) cetaceans of the southern hemisphere, including one never seen before. Their encounter took place somewhere between Australia and Cape Horn at 49° South. It’s strange they didn’t specify where in this 14,000+ km expanse they were, aside from the implication it was far away from any major landmass. d’autres dauphins ayant de chaque côté du corps , dans presque toute sa longueur, deux larges lignes blanches, coupées à angle droit par une noire; ce qui, vu par le dos, formoit une croix noire sur un fond blanc. Ils n’avoient qu’une nageoire dorsale assez aiguë. The dolphins had two broad white stripes along most of their length, and were intersected at a right angle by a black marking. From behind, the coloration gave the impression of a black cross on a white background. The dorsal fin was ‘acute’ or ‘sharp’ in shape. Nous ne fûmes pas non plus assez heureux pour nous les procurer. They could not procure the dolphins as specimens. It’s a pity they didn’t estimate their minimum distance from the dolphins. 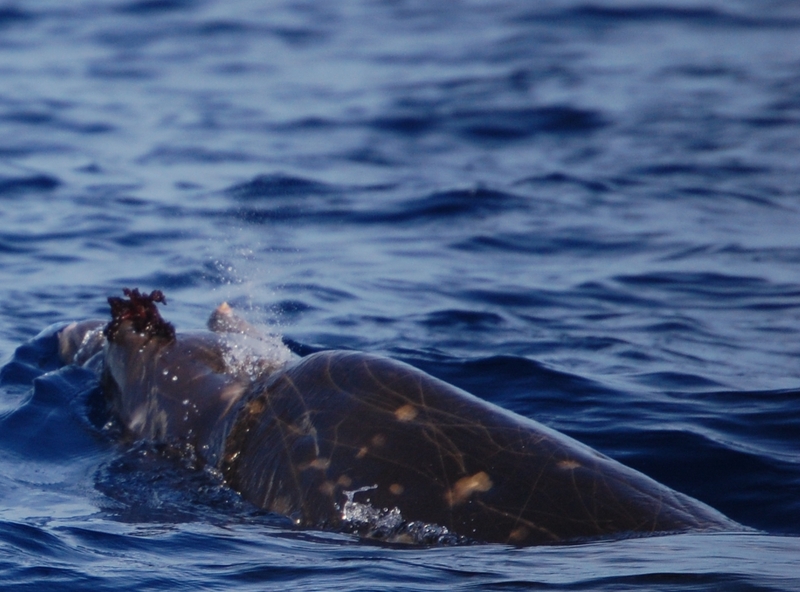 A few days later, they observed a singular dolphin characterized by a white stripe behind its head. They suspected it may have been a color variant or juvenile specimen of the previously observed species, which implies it was similar morphologically. toutefois, pour les distinguer, nous nommâmes la première crucigère [ delphinus cruciger ] ( planche 1 1 , figures 3 et 4 ) , la seconde albigène [ delphinus albigena ] ( même planche , figure. 2 ). Despite not capturing any specimens and suspecting synonymy of the second ‘species’, the authors named both. Amazingly, ‘delphinus cruciger‘ is still with us today as Lagenorhynchus cruciger, the Hourglass Dolphin. Hourglass Dolphins, from Wikipedia Commons. 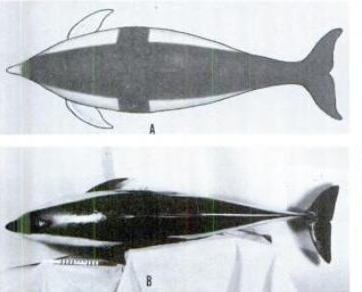 The Hourglass Dolphin is not unique in being initially described from a sighting; Sousa chinensis (Osbeck, 1765) was as well, although at least it had the excuse of having been observed one year before Linnaeus published his taxonomic system (Jefferson & Karczmarski 2001). It has been argued that Quoy & Gaimard’s vague ‘delphinus cruciger‘ should not be considered a valid taxonomic entity but that the replacement name would, somehow, be… Lagenorhynchus cruciger (True 1889). There seems to be an informal statute of limitations in regards to bad early cetacean descriptions (many lack type specimens) meaning “Quoy & Gaimard (1824)” will probably be stuck on this species forever. Quoy & Gaimard’s ‘delphinus cruciger’ vs. the real thing. From Fraser (1966). So how did Quoy & Gaimard’s crucigère become synonymized with a dolphin which doesn’t bear a cross (Ellis 1982)? The description of the lateral coloration (white stripes interrupted by black) coupled with the locality makes it likely they really did observe Hourglass Dolphins. As for the cross, it may have been a combination of only the upper backs of the dolphins being observed, distance and religious apophenia. 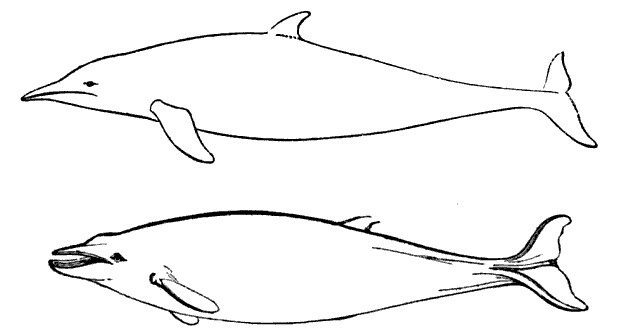 Quoy & Gaimard’s other vague dolphin, ‘delphinus albigena‘, is now synonymized with L. cruciger, which seems plausible considering the implied morphological similarity, but would require only the front half of the animal to be observed. Quoy & Gaimard (1824) described another new species I haven’t mentioned yet, right before the crucigère and albigène in fact – the so-called Rhinoceros Dolphin. More soon, I swear. Ellis, R. (1982) Dolphins and Porpoises. Alfred A. Knopf. 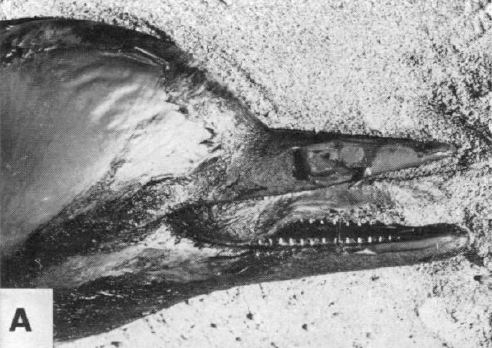 Fraser, F. C. (1966) Comments on the Delphinoidea IN: Norris, K. S. Whales, Dolphins, and Porpoises. University of California Press. Jefferson, T. A. & Karczmarski, L. (2001). Sousa chinensis. Mammalian Species 665, 1-9. Available.